So I am thinking that the next best thing to being on a safari would be to create a safari theme for your next fondue dinner party. Ask your family and friends to dress in their favorite safari gear (safari suit, leopard print clothes, khaki shirts and shorts, a loin cloth if game) to get that fun party vibe happening. Transform your indoors and outdoors into the African Serengeti by using African paraphernalia to create a safari ambience your guests will enjoy! I have put together below a few ideas which are simple and fuss free to start you on your dinner party journey! Bring the party to your house and take a walk on the wild side with these fabulous safari party invitations. Cheetah Print Party Invitation Set. Includes 10 Invitations, 10 White Envelopes, and 10 matching “You’re Invited Envelope Seals. This beautiful African table runner adds a soft touch and will bring an elegant feel to your safari inspired table. Table runner is made from 100% polyester. Comes in 2 sizes 13″ Wide x 70″ Length (32.5 x 175 cm) and 13″ Wide x 90″ Length (32.5 x 225 cm). Machine wash on cold delicate cycle but hand washing is the best, lay flat to dry. Take your guests on a wonderful safari experience with this stoneware dinnerware and add an earthy pop of color to your tablescape. 16 piece dinner set, service for 4 includes a dinner plate, salad plate, bowl, and mug. Set of 6 black ribbed 100% cotton placemats. Size of placemats is 13″ x 19″. Set of 12 Egyptian Cotton Dinner Napkins. Set of 6 mahogany wood safari napkin rings ~ elephant, cheetah, lion, rhinoceros, giraffe and zebra. Hand carved by skilfull artisans in Kenya. To bring a safari ambience to your dinner table these table accessories are the go to. Why not fill mason jars with sand and place open safari fans inside in an upright position and just by using large leaf fronds in a tall vase as a centrepiece you will create an impressive safari tablescape. Hand-painted bronzed trio of elephants parade around a pillar candle of your choice. Holds one 3″D pillar candle (not included). Made of hand-painted polyresin and has PVC dots under the base to help prevent surfaces from being scratched. Candle holder measures approximately 6.5″L x 7″W x 4″H overall. Red and Brown Giraffe Statue stands 18 inch High, 3 inch Long, 2.5 inch Wide. Creatively Cast in Resin in Intricately Carved Detail. Pedestal tealight holder comes in three designs, zebra, tiger and leopard (zebra design shown here). Tealight holder is 7″ tall and made from poly resin. Holds one tealight candle (not included). This elegant vase is 100% hand-carved from sustainable orchard wood. Measures 14″h x 4″ x 4″. Includes 48 animal print fans. Each fan opens up to 10 inches. Set of six hand cast pewter and hand painted charms. Unique whimsical wine charms individualize wine glasses by wrapping a loop around the stem. Why not bring the African Serengeti to you and your guests by hanging lanterns and wall decorations; decorating the room with wooden crates and safari inspired balloons, and install tiki torches to brighten up the backyard to create the visual look for your safari themed party. Combining this with your tablescape you will definitely impress your guests. Pack contains (50) 11″ balloons. Pack of 12 animal print hanging paper lanterns. Hand carved and painted wooden African giraffe jungle mask. Size – 22″H x 6″W. Pack of (12) 57″ bamboo torches. Easy pour wide mouth canister means less mess. Burns up to 5 hours with each 12oz fill. 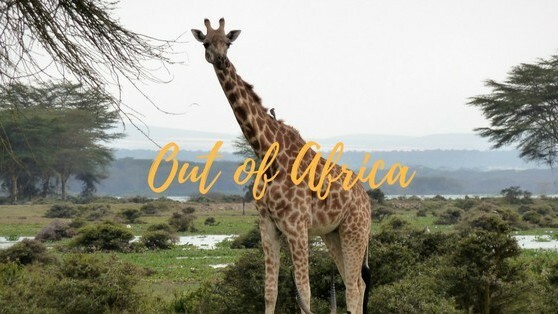 Looking for safari inspired music, a few music selections to bring your safari party to life could be “Out of Africa”, “Lion King”, or maybe a compilation album.